Al-Adhamiyah (Arabic: الأعظمية‎, al-aʿẓamiyyah; BGN: Al A‘z̧amīyah), also Azamiya, is a neighborhood and east-central district of the city of Baghdad, Iraq. It is one of nine administrative districts in Baghdad. Adhamiyah is located north-west of the city center and is an upscale area. It has 100,000 inhabitants. This area was 85% Sunni, 15% Shi'ite before 2003 and the Iraqi invasion. Now, it serves as one of the few points of refugee for the Sunni minority of Baghdad, and nearly totally Sunni in its religious composition. The base of the population consists of people with a high intellectual background, whether it be politicians, artists, scholars and even sports figures. The name is a reference to Abū Ḥanīfah an-Nuʿmān, known as al-Imām al-Aʿẓam (Arabic: الإِمَـام الأَعـظَـم‎, "The Great Imam"), a renowned scholar and founder of the prominent Sunni Hanafī school of Islamic religious jurisprudence. Abu Hanifa Mosque is a prominent landmark, built around the tomb of Abū Ḥanīfah an-Nuʿmān. Adhamiyah neighborhood dates back to the Abbasid period and is one of the oldest areas of Baghdad. Although Adhamiyah has been the site of many clashes between Iraqi insurgents and US forces as well as tensions between Shi'ite security forces and Sunni residents, in September 2005, the residents of Adhamiyah were credited with saving hundreds of Shi'ite lives. Shi'ite pilgrims, who were caught in a stampede on Al-Aimmah Bridge, while coming from the opposing shore of Kadhimiyah, began jumping from the bridge in an attempt to escape the crush, only to face drowning in the Tigris below. Adhamiyah residents dove into the waters, pulling hundreds of Shi'ites to the shore, where their fellow residents transported them to hospitals and mosques. In some cases, residents used mattresses from their own beds as makeshift stretchers. A teenage Sunni called "Othman Ali Abdul-Hafez" drowned while rescuing people. According to the Interior Ministry, upwards of 900 Shi'ite pilgrims died in the stampede, with over 400 wounded. Shi'ite families forced out in 2006 post-Samarra fled to surrounding Shiite neighborhoods like Shaab. Sunni families displaced from these Shiite areas moved in. Many long-established Sunni residents went abroad and either locked their homes or arranged for trusted Sunni neighbors to guard them against displaced Sunni newcomers, fearing people who might break into the house and stay there. 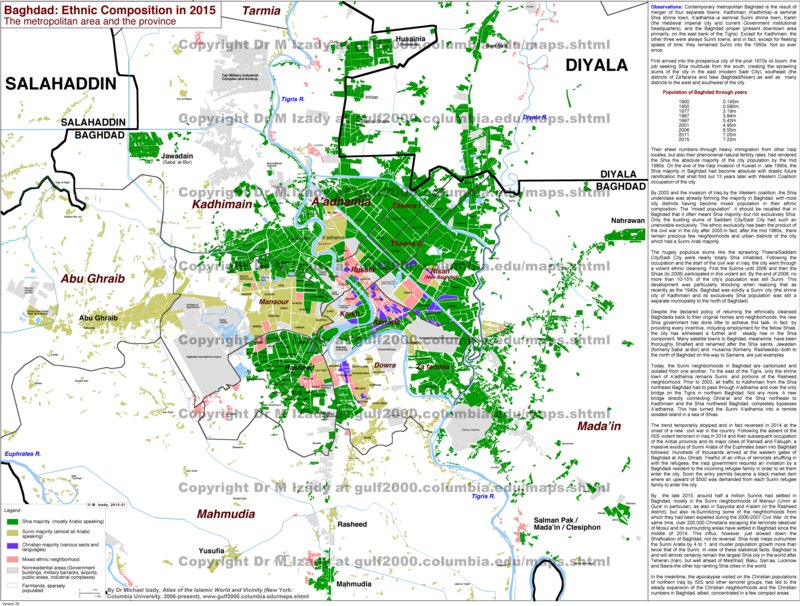 As of 2015, Adhamiyah remains one of the few majority Sunni districts in Baghdad. On April 10, 2007, Coalition forces began to construct a 5-kilometre-long (3 mi), 3.7-metre-high (12 ft) wall around the Adhamiyah neighborhood in an attempt to reduce Sunni-Shi'a violence. Prime Minister Nouri al-Maliki called for a halt to construction on April 22, but it was finished anyway in May. During summer 2007, two Bradley Fighting Vehicles were destroyed by deep buried IEDs in the Adhamiyah area. One was from C Company and one was from A Company, Task Force Spader, 1st Battalion 26th Infantry Regiment of the 1st Infantry Division, US Army. Sniper and IED tactics were commonly used against Coalition forces in the area during this time. By late fall 2007, life in Adhamiya had begun to resemble a city again with traffic jams, the reopening of shops, and an abatement of violence. Security efforts of the 2-319th AFAR 82nd Airborne Division, 3rd Squadron 7th Cavalry Regiment and cooperation of the local law enforcement and military. However, in January 2008 terrorists killed Col. Riyadh al-Samarrai, a founder of the Sunni Awakening Council, a new American ally, in Adhamiya at the offices of the Sunni Endowment. He was a close aide and security adviser to the leader of the Sunni Endowment, Sheik Ahmed Abdul Ghafour al-Samarrai, who held Al Qaeda responsible. Electricity has improved. Six or seven hours a day is the quota, although people still rely heavily on private generators. Americans guarded fuel convoys going through the wall until June 30, 2009, when they withdrew from the city pursuant to the security agreement with Iraq. Garbage removal has improved. Americans are clearing rubble, and young Iraqis have been hired to pick up trash, but people often burn garbage at the huge trash dumps nearby, which is a nuisance for residents. ^ al-Aadhamy. History of the Great Imam mosque and al-Adhamiyah mosques 1. p. 29. ^ "Sunni rescuer hailed as Iraq hero". BBC News. 2005-09-05. Retrieved 2013-11-09. ^ "Iran blames disaster on 'suspicious hands'". Theage.com.au. 2005-09-01. Retrieved 2013-11-09. ^ Baghdad: Ethnic Composition in 2015, the metropolitan area and the province. 2015. ^ "Iraqis Decry US "Separation Wall" Archived October 9, 2007, at the Wayback Machine", U.N. Observer, 4-21-2007. ^ "Al-Maliki demanded a halt to construction of a wall around Sunni neighborhood in Baghdad", International Herald Tribune, 4-22-2007. ^ "Lead Surge Brigade Returns to Fort Bragg". dvidshub.net. Retrieved 13 April 2018. Nizza, Mike. "Baghdad’s ‘Great Wall of Adhamiya’" (Archive). The New York Times. April 20, 2007. This page was last edited on 26 March 2019, at 14:53 (UTC).